Review date: 15 May 2001. The trouble with buying an expensive fancy sound card is that it doesn't let you show off enough. OK, it may have positional this and multi-channel that and digital the other, but it's a card inside your computer. A row of connectors at the back of the box, even if they're gold plated and two of them are optical, is unlikely to get you any oohs and ahs. Plus, sound gear traditionally has knobs and buttons. A physical volume knob is a very handy thing. And it doesn't hurt to have input connectors on the front panel of your computer, if you're interested in using the PC for digital recording. A connector panel on the front may spoil the featureless-Bauhaus-aluminium-panel look desired by the Lian Li case enthusiast. But if you prefer the bells, whistles and gongs look (and it's not hard to see that a lot of people do), then easily accessible controls and connectors are for you. Even if you don't need them. Creative have addressed the combined pose value and convenience shortfall with their top-of-range Sound Blaster Live Platinum, which comes with a control and connector panel that sits in one of your case's 5.25 inch bay cut-outs. Here in Australia, though, you're looking at more than $AU450 for the Platinum. You can get a GeForce2 Pro video card for less than that. Hercules have gone one better, and produced a more impressive looking but cheaper product, with the Game Theater XP. They couldn't fit all the ins, outs, knobs and lights into a lousy expansion bay. They needed a whole separate box. Hercules call this extra box an "external rack", which it isn't. It's just a 45 by 215 by 155mm (1.75 by 8.5 by 6 inch) black box with a purple front panel. The word "rack" implies it's got some sort of mounting dingus for other hardware, or that it complies with the professional 19 inch rack standard, or something. It doesn't. But "rack" sounds better than "box", so what the heck, I'll humour Hercules and call it that. ...this imposingly thick cable from the single three-rank high density D connector on the back of the card to the matching socket on the rack. The cable makes the average automotive jumper lead look very flexible indeed, but it's a generous two metres long. Which means you can install the XP in just about any computer and put the rack somewhere you can easily reach it. 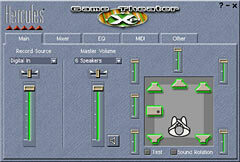 The Game Theater XP is built around the Cirrus Logic CS4630 chip, which has turned up in a few other sound cards, too. It's definitely up there with the best Creative can manage. 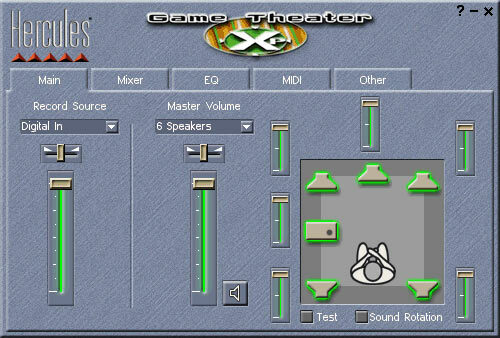 Like every other serious gamer's sound card at the moment, the Game Theater XP supports a laundry list of sound Application Programming Interfaces (APIs). Microsoft's DirectSound 3D, Creative's EAX 2.0, Aureal's A3D 1.0, Interactive 3D Audio Rendering Guidelines Level 2.0 (I3DL2), and the various and amusingly named "technologies" (MacroFX, ZoomFX, EnvironmentFX and MultiDrive) which are really all just parts of the Sensaura positional audio system. What all of this stuff actually does is positional and environmental audio. See the sidebar to the right for more on what the heck this means. It's all highly hardware accelerated in the Game Theater XP's case, which means that intensive positional audio activity - lots of sound sources, lots of movement - will neither take a huge chunk out of your game frame rate, nor leave you with weird sound artefacts as the playback system throws stuff away in the name of speed. 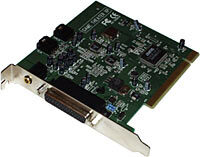 The Game Theater XP PCI card has an eighth-inch stereo connector on the back for the Aux-1 input, and two standard four-pin connectors for internal analogue sound sources - Aux-2 and CD-in. There's no internal S/PDIF input, and all of the other connectors are on the rack. The front of the rack has two RCA connectors for left and right analogue input, and quarter-inch connectors for headphones and microphone. You get a quarter-to-eighth-inch adapter so you can connect small-plug 'phones. The mic input's shared with the line in; you can only use one at a time. There's a volume control for the 'phones and a level control for the mic. The front panel also has a standard gameport socket for your joystick or game pad. 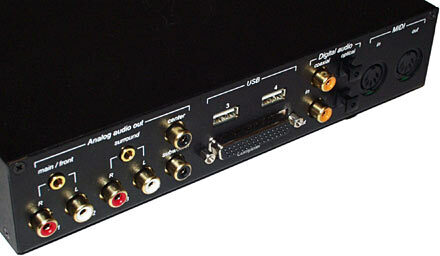 On the back of the rack, you get S/PDIF digital input and output connectors, both RCA and optical, and two five-pin DIN MIDI connectors, one for in, one for out. As usual for PC sound hardware, there's no MIDI through connector. The big news for many users, though, are the analogue outputs on the back of the rack. Full six channel output, kids - RCA connectors for front right and left, rear right and left, centre channel, and subwoofer. If you want your front and rear speakers to be computer speakers that use a stereo eighth-inch plug rather than RCA plugs, you don't need to get an adapter; the front and rear outputs also have an eighth-inch socket. The rack also serves as a four port self powered USB hub. There are two USB ports on the front and two on the back. 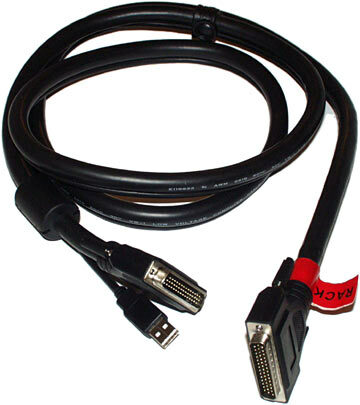 The rack's cable has a separate connector at the PC end, for you to plug into one of the USB ports on the back of your computer. The hub draws power from the PCI slot you plug the Game Theater card into, and so it doesn't need a separate plugpack. All of the connectors are gold plated, which is not a good thing unless all of your plugs are gold plated too. Otherwise, galvanic corrosion effects will just corrode your chrome plated connectors faster than they'd otherwise rust, and you'll get a lousier connection in due course. This is unlikely to cause any serious problems, though. Just twisting the plug will break up the corrosion and give you a decent contact again, if it does have a significant effect. But even with gold plugs, gold connectors don't actually make a big difference to anything unless you live by the seaside. The basic drivers for the Game Theater XP (you can get the latest drivers by picking the Game Theater XP from the drop-down box on the Hercules download page here) work with all current flavours of Windows - 95, 98, 2000 and ME. You also get a few bundled apps which you may find useful, and some others you're almost certain to find useless. Yamaha's S-YXG50 Soft Synthesizer is great if you want to dabble with MIDI - of which more in a moment - but not very interesting otherwise. There's also MusicMatch Jukebox, but the free downloadable Basic version of the software is good enough for most people. There's Kool Karaoke Lite, which is another program you can download for free if you're one of the sick, sick, evil, dedicated-to-the-destruction-of-all-that's-good-about-living people who like that sort of thing. There's Magix PlayR Jukebox, another free-download program that's one of the many less than totally exciting competitors to Winamp. More usefully, there's a proper full six-speaker-enabled version of Cyberlink's PowerDVD. You need a DVD-ROM drive to be able to use it, but if you've got the drive, this software lets you do proper full Dolby surround DVD playback using all six analogue outputs. Just hook 'em up to your surround amp and speakers, or to an appropriate collection of computer speakers; two, four or six speaker (well, 5.1 really; the ".1" is the bass-only subwoofer channel) output is yours, and no decoder hardware is needed. Many other multi-output sound cards let you do some sort of surround-sound DVD playback, but they usually only have four direct outputs, with no centre or subwoofer channel. And they may or may not work with the quality DVD playback program of your choice. PowerDVD is a quality DVD player package - even if its authors do devoutly believe in rolling their own non-standard interface - and so the Game Theater XP plus a DVD-ROM drive gives you a proper DVD-player-in-a-PC package, ready to rock and roll. If you've only got four speakers, the XP does proper downmixing of 5.1 channel audio to four channels. You just tell it to use four speaker mode and you're away. The full six speaker setup will only work when you're playing DVDs, though. In games, the Sensaura technology that the XP uses means that it only sends sound to the four standard outputs - the front and rear stereo pairs. There's nothing stopping you from connecting a subwoofer/satellite system to one or both of these outputs, of course. But if you've connected a six speaker set, two of 'em won't do anything unless you can connect them to another channel. Buy yourself a 5.1-capable Sound Blaster Live and you get six speaker sound for everything - but the card itself doesn't have six outputs. 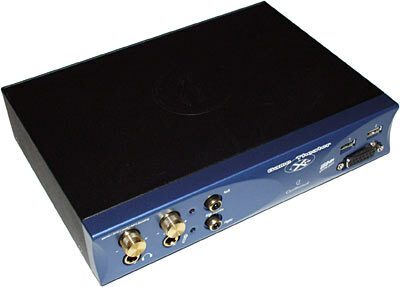 You need an outboard 5.1 channel decoder/amp with digital input. If you've got a fancier home theatre setup with a multi-channel decoder/amp that's got digital input, PowerDVD with the XP is also alleged to let you send S/PDIF straight to the decoder via the XP's digital outputs, in all versions of Windows, in exactly the way that some cards with digital out don't. I don't have a digital-in decoder to test it with, though, so I'm just going on others' say-so here. The XP also supports Dolby Headphone, for positional-audio surround from headphones, so you don't strictly speaking need a speaker set at all. What there isn't in the Game Theater XP software bundle, is a decent audio record-and-edit package. You do get Sonic Foundry's ACID XPress, but that's another free-to-download package, and it's not a general purpose audio manipulator - it's for making loop-based music. If you're buying a Game Theater XP as a cheap-ish way into semi-pro PC sound editing, you'll therefore have to drop some dollars on Cool Edit, Sound Forge or whatever other audio editor takes your fancy. There also aren't any bundled games - well, not full versions, anyway. Which is a good thing, if you ask me. The games that come bundled with many pieces of brand name hot gamer hardware are, often, quite good. But they're seldom very new, which means the nutty gamers that are paying for the hardware will either already have them, or not want them. Better to keep the frills to a minimum and the price down. You do get the Gameloft multiplayer game-finding package, which seems to me to just be the GameSpy you use when you're tired of the popular option. The Gameloft package gives you some game demos, as well - Tachyon: The Fringe, Rayman 2, 10SIX, Thief 2 and, wait for it, Daikatana. And Nvidia's Quake 3 Arena level. These are all free downloads too, of course. And not particularly new, in the great tradition of bundled game-stuff. The bundled XP utility that gamers are likely to use is Sensaura's "Virtual Ear", which lets you tweak the XP's positional audio to suit the oddities of your listening environment and/or cranium. Not every Sensaura-supporting sound card comes with Virtual Ear, and it's not a free download. No serious electronic music person's going to use a consumer sound card as a MIDI sound module, and MIDI background music for games is also now pretty much a thing of the past. But decent MIDI music capabilities are still a nice thing to have if you want to do composition on the cheap, and the Game Theater XP has a perfectly all right eight megabyte set of General MIDI samples by default. Yamaha's Soft Synthesiser can do a heck of a lot more, by making the PC do the mixing work and letting you download very large sample sets. It's still no substitute for standalone MIDI gear, but it's darn good for the money. The Game Theater XP is probably the least CPU-intensive of all the current high-end consumer sound cards. In most intensive multi-audio-stream tests, it seems to beat the Sound Blaster Live models by a factor of two or so. This is almost completely irrelevant. If you've got an old, slow processor, then the amount of CPU time a sound card takes up can matter, if you're playing games that use a lot of positional audio. But if you're shopping for a Game Theater XP, you probably don't have an old, slow processor. You can get a 900MHz Duron, with a CPU cooler, delivered, for less than $AU240 these days. An 800MHz Celeron's only about $AU15 more. Both of these processors need less than 10% of their power to play 32 simultaneous DirectSound streams through a Sound Blaster Live. The XP should have less than half of the CPU penalty, but you're not at all likely to notice the difference. A sound card with little or no ability to do positional audio in hardware - your standard yum cha $AU30 board - will either drop the job on the floor and just revert to plain stereo panning for some or all of the positional channels, or the drivers will hand the task off to the CPU. In the first case the game stays fast but sounds unexciting; in the second case the game takes a substantial frame rate hit, even if you've got a fast CPU. But all of the high-end cards have a lot of 3D audio muscle on board, and so CPU utilisation on vaguely recent processors is low for all of them. The XP also does hardware MPEG 1 Layer 3 (MP3) decoding. Well, it can do hardware MP3 decoding, provided your MP3 playback software asks it to. Your MP3 playback software won't ask, if it doesn't use the DirectShow MP3 decode routines, which most don't. On a modern faster-than-1GHz PC, you can realistically expect playback of a single stereo MP3 stream without hardware accelerated decoding to take up only about 2% of your CPU power. This is therefore not a big deal. Even if you've got, say, a mere 400MHz Celeron, you still ought not to need more than 10% of your CPU grunt for MP3 playback, unless you're using some particularly inefficient codec. Which means it's not going to have much impact on anything. More and more games have MP3 background music and effects, because the super-compressed format lets the programmers fit a ton of sound on a CD. But even when the sound's being played in real time, it doesn't hurt performance much on any somewhat recent PC. What's bad about the Game Theater XP? Well, not much, except that most people don't need it. If you ask me, the whole idea of using a PC as the core of your home theatre system is a bad one. It's a good solution if you're short of money and/or space and want a top-notch solution, technically speaking, without adding lots more boxes to your life. The six analogue outputs on the XP rack let share-accommodation dwellers easily set up a home theatre in their room so they can watch what they want in multi-channel glory while the hoi polloi consort in the common room. If that's what you want, this is the product for you. But as a replacement for a "blackgoods" DVD player, PC DVD solutions are all clunky. Even the ones with a remote control still make you put the humming PC somewhere fairly near the TV if you're not satisfied with the size of your monitor (of course, you need a video card with TV output to do this at all), and the XP doesn't have a remote anyway. If you've already got a DVD-ROM drive then this is a nice extra, I suppose, but if you're considering taking the PC-DVD route, I suggest you price some cheapie standalone DVD players instead. If you're a game hound, the lack of full 5.1 channel output for games is a bit of a pain, but it's not as if games actually have a 5.1 channel soundtrack. When an SBLive feeds game sound to a six speaker system, it's just filtering and mixing for the two extra speakers, and the result sounds no better than would a couple of three-piece stereo-input sub-sat systems of similar quality tot he 5.1 speakers plugged into an XP. If you're the ninja-gamer type and want positional audio for tactical reasons as much as entertainment ones (knowing which way to turn, and how far, to shoot the guy you hear walking up behind you, is a handy thing), then you're going to be playing with quality headphones anyway and this issue goes away. Yes, positional audio works with headphones. It works better than it does with multiple speakers. Trust me, I'm a trained professional. Overall, given the XP setup's spectacular show-off appearance, plethora of ins and outs and reasonable price compared with top-end Sound Blasters, it's a definite winner. If you just want decent vanilla four channel positional audio for games then there are various cheap options - the entry-level SBLives, and Yamaha-chipset boards like the AOpen one I review here, just to name a few. The AOpen card's less than $AU70 now. But if you've got a use for the extra features of the Game Theater XP, or just dig its over-the-top presentation, it's great. Recommended. Any half-decent sound card these days has impressively quiet input and output, and can be used for quite serious studio digital audio work, as long as you're happy with basic stereo analogue input and output and don't need fancy digital connectors. But funkier cards like the Game Theater XP have hardware that lets them do positional and environmental audio. They are for sound what 3D accelerators are for video. Positional audio uses advanced psychoacoustic tricks to give you the impression of true 3D sound. In front, behind, above and below; sound sources can be quite clearly localised. This extra realism is more fun, and can be quite handy; as you crouch behind a crate with machine gun in hand, it doesn't hurt to be able to definitely tell which side of the box your enemy is about to walk around. The theory behind HRTFs is, in essence, pretty simple. Humans only have two audio-detecting devices - those little tympanic membranes in our ears - but, without moving our heads, we can locate sounds all around us. The way we do it is by analysing the spectral and phase changes in the sounds that are picked up by each ear; the head, the ears and the environment all change the sound that's emitted by things and the brain decodes the phase rotation and reverberations and relative delays and frequency emphases. Fake some or all of those tell-tale distortions, and you fake the location information too. The practice, of course, is a heck of a lot more complicated than this basic theory. But it can be done, and it has been done; real honest-to-goodness 3D sound, even if all you've got is two speakers. With headphones, it can be spookily good. Environmental audio is, usually, simpler; it's the simulation of what sounds do in particular spaces. It can be simple, just applying canned reverb effects to the sound you hear, or it can be complex, actually "wavetracing" the sound so you get proper wall reflections and sound occlusion by objects. Even the simple kind of environmental audio doesn't just pick from its few dozen presets and stop there; game developers can specify the level of the reverb and the ratio of reverb to unmodified sound. 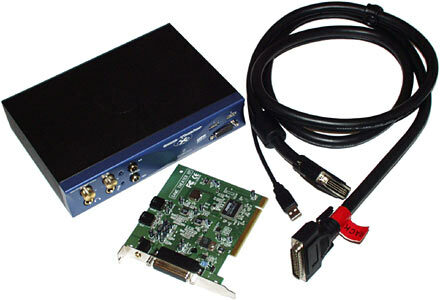 S/PDIF: Sony/Philips Digital Interface Format is an audio transfer protocol that can use either optical or electrical connectors - electrical, in this case. It's used to transfer either 16 bit stereo audio data between various components (CD players, Digital Audio Tape decks, some sound cards), or to transfer Dolby Digital (formerly known as AC-3) 5.1 channel audio for movies.